Moise Katumbi, president of DR Congo side TP Mazembe, says the people who invest in football in Europe should now also look to Africa. The businessman has invested heavily in Mazembe and has seen them win back-to-back African Champions League titles in 2009 and 2010. On the back of the 2010 victory Mazembe also reached the final of the Club World Cup, where they lost 3-0 to European champions Inter Milan of Italy. 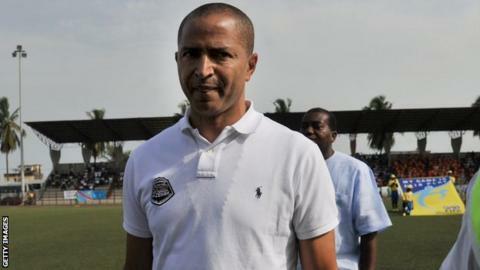 President of DR Congo's TP Mazembe, Moise Katumbi, says African clubs need European-style investment. "What is important for me is to call those investors investing in soccer in Europe to come because the future is Africa," Katumbi told BBC Sport. "The money in Europe is TV money and sponsors money in Africa to have sponsors is a big problem. "There is a not a lot of money because we don't have enough sponsors. He believes that such a boost in finances will also mean more African players staying to play on the continent. "We are trying to offer the best things that we have to our players - it's really tough in Africa to maintain a club," he said. "I think the day African players remain on the continent, then Africa can win the World Cup. "If you are only transferring players it's not benefitting Africa - let's compete fairly." Katumbi also insists that playing continental club football is important to him despite the potential to make a financial loss. "You lose money but you don't have to look just at money," he said. "You have to look at what is the result for football in Africa. "There is a lot of war on our continent and football can bring peace. "I think the day African players remain on the continent then Africa can win the World Cup. "Today you've got very good talent in Africa and can use this talent to bring peace in Africa. "If you have peace in all of Africa you are going to go far in soccer." The 49-year-old says that football has taught him a lot of lessons too. "You are learning to be patient, to know how to share and to accept how to lose," he added. "In life people don't want to accept if they lose anything but in football you accept you lose the cup. "Football is about fair play and coming together."